This sacred scarab answers the call of the valiant. 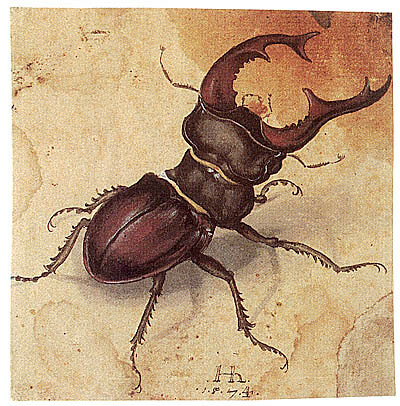 DC Arcana 10: These beetles are serious creatures that greedily devour crops. A lone beetle can consume a whole farm in only a few days. DC Arcana 25: It is possible to train these beasts, and once they are trained they are fiercely loyal to their master. If it is kept well fed it will do anything it is told to do, even throw itself to its death. These creatures tend to wander alone either throughout the shores of the astral sea, or scuttling down dusty corridors in long forgotten dungeons. The try to avoid lesser creatures and will attack if it is surprised. Hit: 2d6 + 8 acid damage and ongoing 5 acid damage. Celestial Giant Stag Beetles tend to scuttle around foes, attacking them with Bite and then moving away, even if they provoke opportunity attacks. If they are reduced to low hit points then they will try attack their enemies from a distance, using "Beetle Spit" to hinder them. Then they will return to melee combat.